Rosewood Realty Group announced the sale of a Section 8 housing portfolio in the Gravesend section of Brooklyn to a subsidiary of the New Jersey-based property owner, Orbach Group for $17 million. The seller was Black Spruce Management. The 51-unit portfolio is comprised of 17 buildings at 2320 through 2336 West 12th Street and 2315 through 2321 West 13th Street. The three-unit buildings contain 34 three bedrooms priced at $2,134 per month, 17 one-bedroom units going for $1,372 a month. The property includes 17 parking spaces, which rent for $175 a month. Black Spruce purchased the portfolio for $11.4 million in June 2015, city records show. “It’s a good area and the buildings were well maintained and have a cash flow, and when you combine all that with the scarcity of the market, it was a good deal,” said Aaron Jungreis of Rosewood Realty Group, noting the properties collectively have a roughly 4.5 percent cap rate. He represented both sides in the transaction. Jungreis also represented the parties last monthen when Orbach sold its Hell’s Kitchen portfolio to Black Spruce for $110 million. Orbach already manages more than 6,000 affordable and market-rate multifamily units across the north east and California. The company wants to increase its affordable housing units in the city, and the Gravesend portfolio has a housing assistance payment contract in place with the U.S. Department of Housing and Urban Development. Tenants generally pay about 30 percent of the rent at the property and the rest is subsidized by the government. “This is a strategic acquisition for us that strengthens our portfolio in both the short- and long-terms,” said Meyer Orbach, the chairman of Orbach. 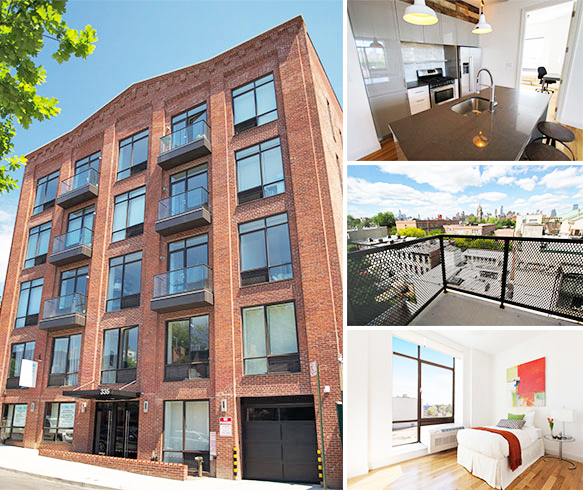 Holliday Fenoglio Fowler has closed the $27.2 million sale of 333-335 Carroll Street, a newly-redeveloped, 30-unit, Class A boutique apartment building in Brooklyn’s Carroll Gardens neighborhood. HFF exclusively represented the seller, 333 Carroll Condominium LLC. Originally built in 1931 as a warehouse loft building, 335 Carroll Street was redeveloped into residences in 2014. The five-story property has a mix of studio, one-, two- and three-bedroom units, some with home office space and balconies. Amenities include a rooftop deck, lounge with TV and pool table, fitness center and below-grade parking. The HFF investment sales team representing the seller was led by senior managing director Andrew Scandalios and managing directors Jeff Julien and Rob Hinckley. Mack Real Estate Group was the buyer, according to Real Estate Driect. The seller was Isaac Fischman. Richard Mack co-founded Mack Real Estate Group in 2013. He runs it with his father, William, and his brother, Stephen. Two contiguous multifamily buildings at 341-343 East 65th Street on the Upper East Side have been sold for $16.5 million, or $803 per square foot. Cushman & Wakefield’s Guthrie Garvin and Michael Gembecki exclusively arranged the said of the The five-story walk-ups which contain 40 one-bedroom apartments, of which 37 are rent stabilized and the remaining three are rent-controlled. The properties are near Memorial Sloan Kettering and other healthcare and educational institutions with accesse to the 68th and 59th Street subway stations, as well as the slated 72nd Street stop on the Second Avenue subway line. “These rent stabilized buildings achieved great pricing, trading at a 2.61 percent capitalization rate. This is due to the continued high level of demand in the rental market place on the Upper East Side. We see room for growth in this submarket as the Second Avenue subway begins to materialize,” said Garvin. Rosewood Realty Group announced the $17 million sale of a six-story elevator apartment building with 60 apartments in Elmhurst, Queens. The 67,200 s/f building at 90-31 Whitney Avenue sold for 16.75 times the rent roll. The cap rate was four percent. It was built in 1936. Rosewood’s Aaron Jungreis represented the seller, Whitney LLC, and Michael Guttman represented the buyer, three private investors that include JD Broadway Realty LLC, JE Broadway Realty LLC and 90-31 Whitney Broad, LLC. So far this year, Rosewood Realty has closed over ten Queens deals representing 30 buildings worth over $500 million. In July, the company closed the $72.15 million sale of a six-building portfolio in Jackson Heights, Queens featuring 324 units. TerraCRG has been retained to represent ownership in the ground leasing of three senior housing development sites in the recently rezoned East New York neighborhood of Brooklyn. Dan Marks and Adam Courtney, along with their team, are marketing the properties. “The increasing demand for high quality and affordable senior housing across the country, and particularly in Brooklyn, makes this offering an excellent opportunity for developers,” said Courtney, associate vice president at TerraCRG. Under the new ZQA zoning, 435 Schenck Avenue, 475 Hendrix Street and 419 Hendrix Street offer a total of 147,600 s/f additional development rights for as-of-right senior housing. East New York has begun to attract developers looking to take advantage of Brooklyn’s next emerging neighborhood. The recent rezoning has created new demand and will bring density and retail amenities to an already growing neighborhood. Cignature Realty Associates brokered the $9.4 million sale of a five-story corner multifamily walk-up building in the Inwood section of Manhattan to Hillcrest Acquisitions. The seller was Geisinger Equities. Cignature Realty’s Lazer Sternhell and Peter Vanderpool represented both the buyer and seller in the transaction. The building, which was built in 1928, is located at 546 Isham Street at the southeast corner of Isham and Vermilyea Avenue. It is approximately 37,700 s/f and features 49 apartments: 32 one-bedrooms, 10 two-bedrooms, four three-bedrooms and three studios. None are free market. The property traded at $249 per square foot on a price per unit basis of $191,836. According to the brokers, Geisinger Equities, led by Larry Geisinger, bought the property in 1985. “The building was in great condition with no heavy lifting needed in terms of repairs. The average rent per apartment and the average rent per room were very low, leaving the new owner with tremendous potential to increase the rent roll,” Vanderpool said.